:Veteran missionary-scholar Roberta King draws on a lifetime of study and firsthand mission experience to show how witness through contextualized global arts can dynamically reveal Christ to all peoples. King offers the global church biblical foundations, historical pathways, theoretical frameworks, and effective practices for communicating Christ through the arts in diverse contexts. Supplemented with stories from the field, illustrations, and discussion questions, this textbook offers innovative and dynamic approaches essential for doing mission in transformative ways through the arts. It also features a full-color insert of artwork discussed in the book. 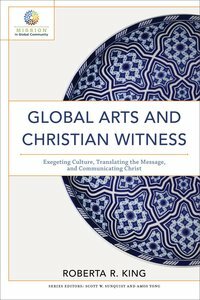 About "Global Arts and Christian Witness: Exegeting Culture, Translating the Message, and Communicating Chrisian Witness"
prelude: My Art, God's Mission?